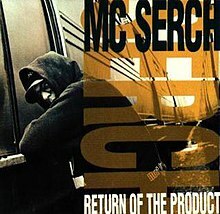 Return of the Product is the only solo studio album by former 3rd Bass member MC Serch. It was released August 25, 1992 on Def Jam Recordings/Columbia Records/Sony Music Entertainment. Recording sessions took place at Chung King Studios in New York City, at Chapel Studios and Red Chamber Studios in Los Angeles. Production was handled by T-Ray, Skeff Anselm, Epic Mazur and Richard Wolf, with MC Serch serving as executive and co-producer. It features guest appearances from Chubb Rock, Joe Fatal, Nas and Red Hot Lover Tone. The album peaked at number 103 on the Billboard 200, at number 28 on the Top R&B/Hip-Hop Albums and at number 2 on the Heatseekers Albums in the United States. Return of the Product spawned a hit single "Here It Comes"/"Back to the Grill", which reached number 1 on the Hot Rap Singles chart. The title of "Back to the Grill" is a reference to the 3rd Bass track "Kick 'Em in the Grill". 2. "Don't Have to Be"
5. "Return of the Product"
6. "Daze in a Weak"
7. "Can You Dig It"
10. "Scenes from the Mind"
11. "Here It Comes Again"
^ Brown, Marisa. "Return of the Product - MC Serch | Songs, Reviews, Credits | AllMusic". AllMusic. Retrieved December 3, 2018. ^ Bernard, James (September 4, 1992). "Kizz My Black Azz; Return of the Product". Entertainment Weekly. Retrieved December 3, 2018. ^ Tannenbaum, Rob (October 1, 1992). "Return of the Product : M.C. Serch : Review : Rolling Stone". Rolling Stone. Archived from the original on October 24, 2007. Retrieved December 3, 2018. ^ "MC Serch Chart History (Billboard 200)". Billboard. Retrieved December 3, 2018. ^ "MC Serch Chart History (Top R&B/Hip-Hop Albums)". Billboard. Retrieved December 3, 2018. ^ "MC Serch Chart History (Heatseekers Albums)". Billboard. Retrieved December 3, 2018. This page was last edited on 27 January 2019, at 21:55 (UTC).